In accordance with the Privacy Act (PL 93-579) passed by Congress in 1974, the Department of State cannot release certain information regarding you to anyone without your written consent except as set forth in the Act. Please complete the authorization below, consenting to the release of information about your employment history and background and criminal history to members and staff of the Senate Foreign Relations Committee for the sole purpose of responding to inquiries about your nomination. Please return the completed authorization to the Bureau of Human Resources, Office of Presidential Appointments. Your consent to the release of this information is voluntary. 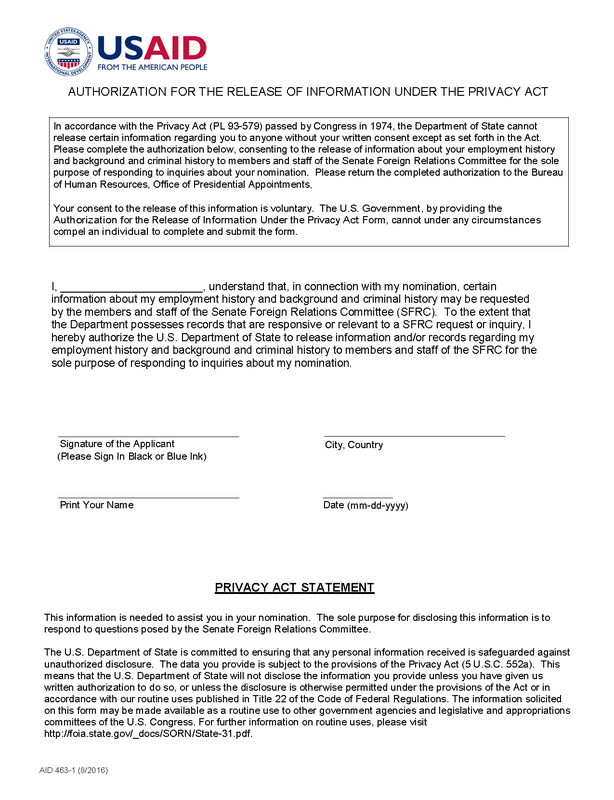 The U.S. Government, by providing the Authorization for the Release of Information Under the Privacy Act Form, cannot under any circumstances compel an individual to complete and submit the form.